.01/22/2019 – New Dog Park at Gardiner Park Recently updated ! Construction has begun on a new dog park at Gardiner Park and is expected to be up and running in the spring. For details on the new park go to: New Dog Park at Gardiner Park. 01/22/2019 – New Dog Park at Gardiner Park Recently updated ! New Dog Park in Suffolk County’s Gardiner Park! A large, new dog park is under construction at Suffolk County’s popular Gardiner Park in Bay Shore. The dog park is scheduled to open in the spring 2019. The site for the off-leash area, in the northwest corner of Gardiner Park, has been prepared and in an effort to provide shade during the summer and a more natural setting, many of the existing trees have been left in place, according to Suffolk Parks Commissioner Phil Berdolt. The dog park will have three sections: a 80′ x 300′ small dog area; a 120′ x 300′ large dog area and a 40′ x 100′ agility training area. The provision of a agility training area is a first for a Suffolk County dog park, the Parks Commissioner noted. Each of the sections will be completely fenced by 4′ high black vinyl coated chain link fence. In addition, two watering locations have been installed. The total dog recreation site will cover 64,000 square feet or about one and one-half acres. The funds for the new dog park come from a $100,000 grant obtained by New York State Sen. Phil Boyle. Former Suffolk Legislator (now NYS Senator) Monica Martinez sponsored the resolution in the Suffolk Legislature to accept the grant and authorize the dog park. In order to make sure Gardiner Park works for all park patrons, please keep your dogs leashed unless you are in the dog park itself. Also, as always, please remember to clean up after your dog. The Town of Oyster Bay will not move the dog park located on Clocks Blvd. in Massapequa, according to Town Supervisor Joseph Saladino. While the Town considered moving the dog park to a strip located on the eastern edge of the site, given the controversy that arose over the Town’s plans, moving the dog park is now “off the table,” according to the Supervisor. 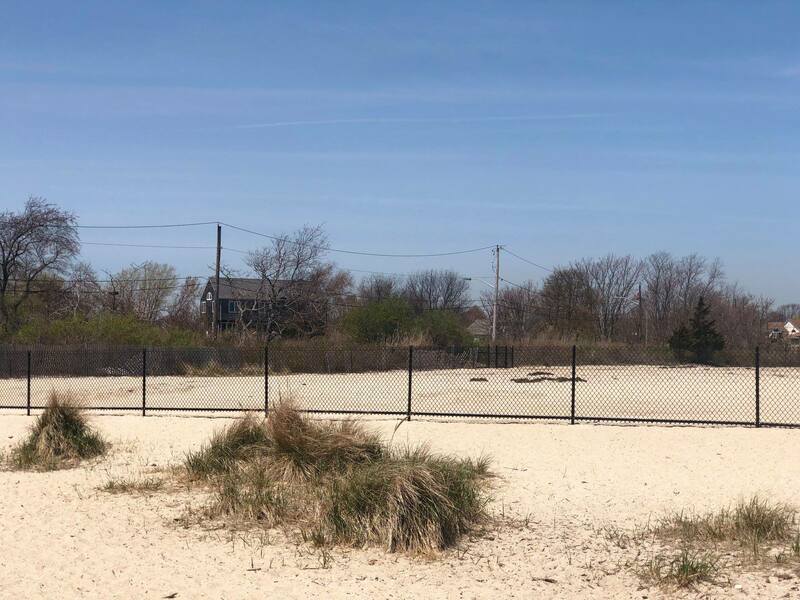 For details on the Massapequa Dog Park situation and plans for a new dog park in Bayville, go to Oyster Bay Vows Won’t Close Massapequa Dog Park. The Town of Oyster Bay will not move the dog park located on Clocks Blvd. in Massapequa, according to Town Supervisor Joseph Saladino. While the Town had considered moving the dog park to a strip of land located on the eastern edge of the property or maybe to a site on the western edge of the Field of Dreams park, given the controversy that arose over the Town’s plans and the opposition of dog owners, moving the dog park is now “off the table,” according to the Supervisor. 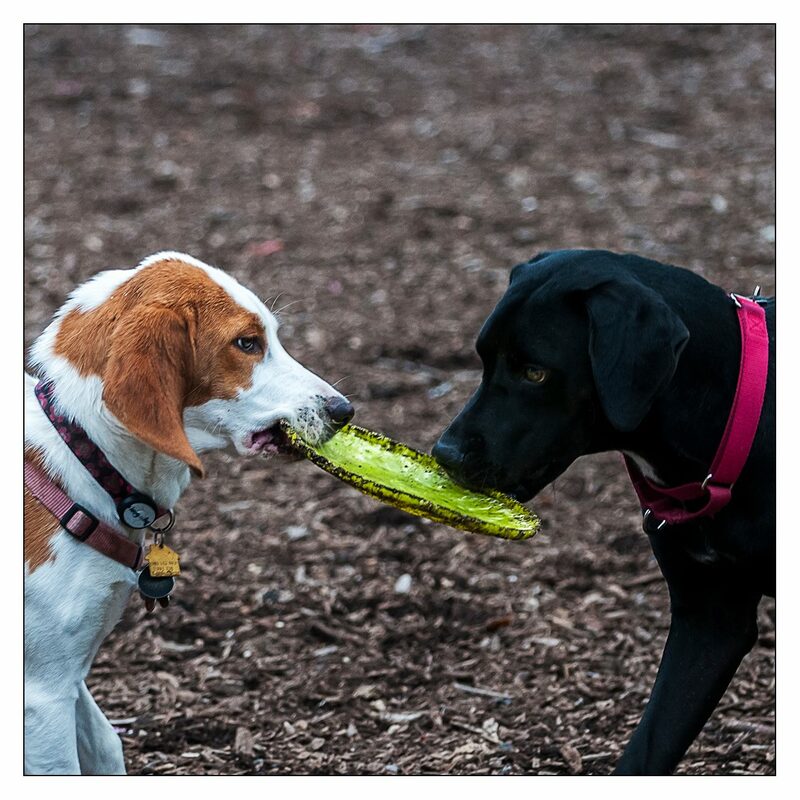 The Town “NEVER had intentions to deprive dog park facilities in Massapequa from our residents,” the Supervisor wrote in a statement to LI-DOG. Rather, the Town was looking at the parcel of land on which the current dog park sits as part of a townwide appraisal of properties done to take advantage of a $2.8 billion New York State land preservation program. “The selling of property to NYS guarantees its preservation, while assisting to further reduce the debt of the town,” stated the Supervisor. “Statements…that the Town of Oyster Bay planned to close the dog park in Massapequa..are untrue,” he said. The reaction to the news from dog owners was swift and unfavorable. “My neighborhood was completely unaware of this until two women approached me yesterday with flyers,” said one post on the Massapequa Dog Park Facebook Group. “Myself and my neighbors are very upset, this is one of the best dog parks around.” Dog owners immediately started a campaign to call and email the Supervisor’s office and on Sept. 23rd a rally in support of the dog park was held at the park, which was covered by FIOS1. The son of a former dog park regular who passed away and to whom a memorial tree has been planted asked that the plaque by the tree be returned to him should the dog park be closed. Since then, Supervisor Saladino, Parks Commissioner Joseph Pinto and other Town officials have worked to assure dog owners that they do not intend to close the Massapequa Dog Park and at this point do not intend to move it. In fact, the town will now look to make enhancements,” said Saladino, pointing to plans to build a dog washing station at the park. Moreover, Saladino added, plans are now underway to build a new dog park on the Town’s north shore. On Oct. 29th, the Town announced that it would receive a $100,000 grant for construction of a new dog park in Bayville as a result of the efforts of New York State Senator Carl Marcellino. According to the Town, it met with north shore residents earlier this year to discuss the construction of a new dog park at Charles E. Ransom Beach in Bayville. In announcing the new dog park, the Town noted that locating the dog park at Charles Ransom Beach will not only benefit dog owners who live in the northern part of town, but will also benefit the Bayville business district by bringing in additional visitors and their pets year-round. “Please know that we love our pets and this administration is committed to expanding opportunities for pets and pet lovers alike in a safe and meaningful way,” the Supervisor’s statement concludes. As a result, LI-DOG has received a commitment from the Supervisor to meet in the coming weeks to discuss ways to increase access to the town’s parks and beaches for Oyster Bay families and their dogs. Thanks to all the dog owners who emailed, called and came together in support of the Massapequa Dog Park! Dog Exclusion Zone Created at Mud Creek Off-Leash Beach! 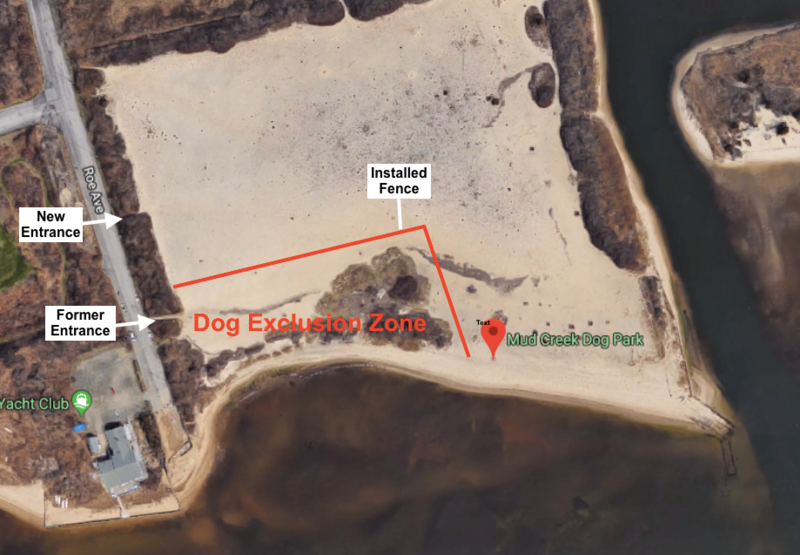 On May 1, 2018, a long line of fencing was installed at Mud Creek Park to create a dog exclusion zone on Suffolk County’s ONLY official off-leash beach. The fencing cost $13,000 and cuts off half the shorefront to dog owners and their dogs. LI-DOG has called on the Suffolk County Legislator responsible for creating the dog exclusion zone to restore the off-leash beach. The zone is unsafe, unworkable and unfair, LI-DOG argues. To get details on the situation and what you can do to help restore the beach, go to Dog Exclusion Zone at Mud Creek. 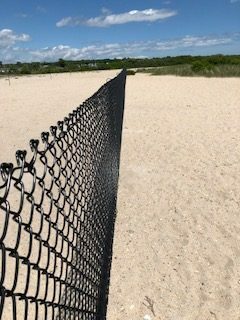 A long line of fencing that creates a dog-exclusion zone has gone up at Mud Creek County Park–Long Island’s only official off-leash beach in E. Patchogue. The fencing, which appeared May 1st, cuts the beachfront available to dog owners in half. 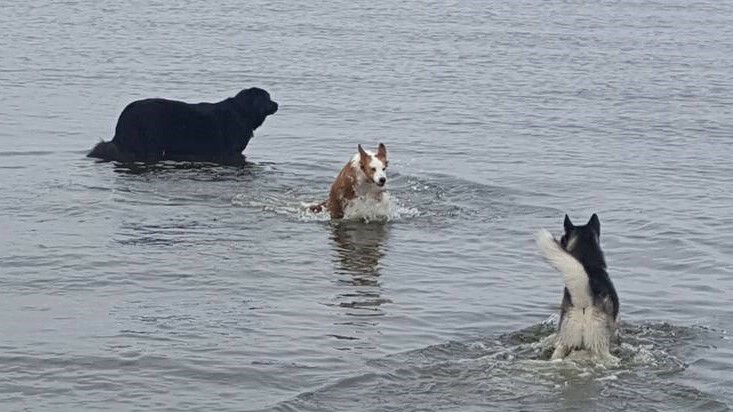 To get the petition and details on what dog owners are doing to save the off-leash beach, go to Dog Exclusion Zone Created at Mud Creek County Park. 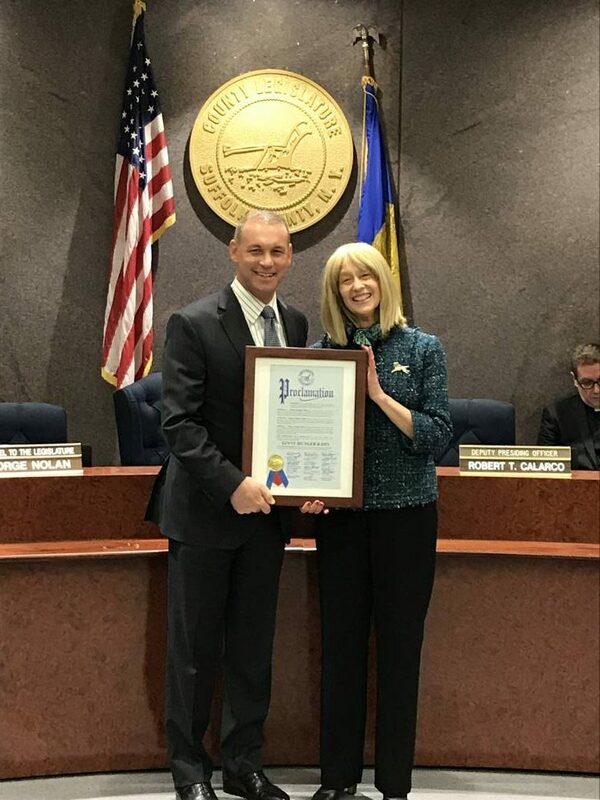 Suffolk County’s dog-friendly parks were celebrated when LI-DOG President Ginny Munger Kahn was honored with a Proclamation from Suffolk County Legislator Steven Stern and his colleagues on the Suffolk County Legislature. “By expanding access to and enjoyment of Suffolk County’s beautiful parks, Ginny Munger Kahn has helped to materially improve the quality of life of thousands of Suffolk residents,” states the Proclamation. To get details on this exciting honor for LI-DOG’s President and how it came about, go to Suffolk County Proclamation Honors LI-DOG President. 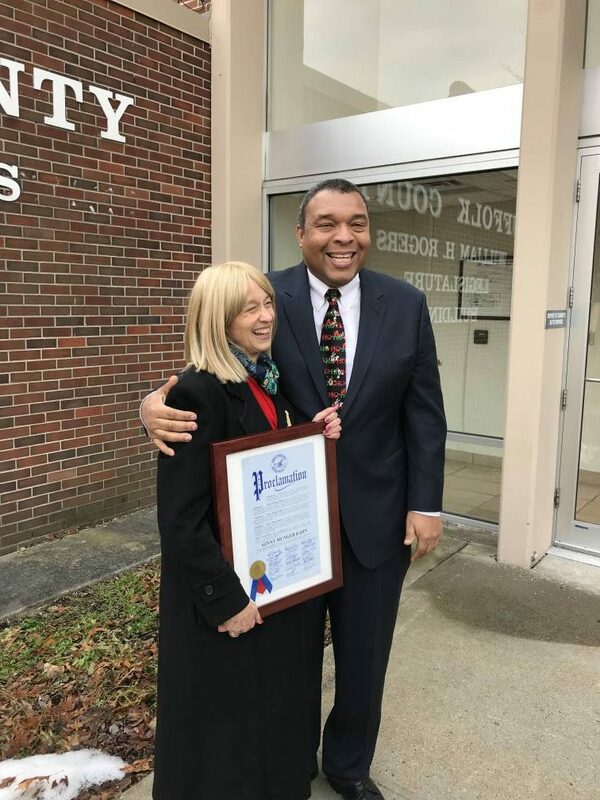 Suffolk County’s dog-friendly parks were celebrated December 19, 2017, when LI-DOG President Ginny Munger Kahn was honored with a Proclamation from Suffolk County Legislator Steven Stern and his colleagues on the Suffolk County Legislature. The Proclamation thanks Ginny for her work helping to create dog parks and dog-friendly park policies in Suffolk County. “By expanding access to and enjoyment of Suffolk County’s beautiful parks and open spaces, Ginny Munger Kahn has helped to materially improve the quality of life of thousands of current and future Suffolk County residents,” states the Proclamation. “In recognition of [that work], we the members of the Suffolk County Legislature do hereby honor Ginny Munger Kahn.” The proclamation is signed by all 18 Suffolk County legislators. Since 1998, LI-DOG has worked with elected officials and Parks officials to create 10 dog parks on Long Island (seven in Suffolk County including an off-leash beach) plus dozens of on-leash dog walking trails. These dog parks are the result of legislation passed in 2007, which Leg. Stern sponsored and with whom LI-DOG worked closely, as well as LI-DOG’s work with other elected officials. Leg. Stern’s groundbreaking 2007 legislation directed the Suffolk Parks Commissioner to identify at least five parks where dog parks could be created. Ginny also thanked former Legislators Lou D’Amaro, Kate Browning, Jon Cooper, John Kennedy and William Lindsay for their work to create dog parks in their communities. “Dog parks may seem like a simple thing,” said Leg. Stern, “but if you’re a dog owner and you like spending time outdoors with your dog and other members of the community who share that love for being outdoors with our best friends, you know how important dog parks are. So with Ginny’s help and the help of so many who are active in LI-DOG, one of my first legislative initiatives was establishing the first dog parks in Suffolk County parks,” said Leg. Stern. “Today, these dog parks are thriving, they bring community members together and they have a great impact on our quality of life,” Leg. Stern noted. 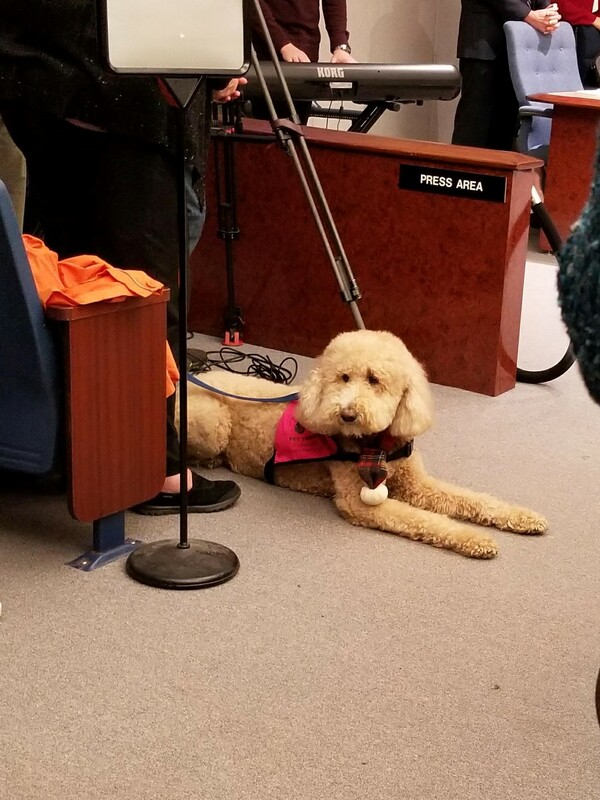 As LI-DOG’s representative on the Huntington Greenway Trails Citizens Advisory Committee, Ginny more recently worked on the committee’s recommendation to adopt uniform park standards for leashed dogs in Huntington Town Parks. The recommendation was designed to align Town parks policy with Suffolk County, which allows leashed dogs throughout its 48,000-acre park system. In August 2017, the Huntington Town Board unanimously passed the resolution that opened virtually all Town parks to leashed dogs. Ginny and LI-DOG continue to work with Suffolk legislators and the Suffolk Parks Dept. to make sure the County’s dog parks and the County’s dog-friendly park policies work well for park users. Ginny also thanked her LI-DOG colleagues for their significant help in making Long Island parks more dog-friendly. “As is true with any accomplishment, I share this with my LI-DOG colleagues—Barbara Buscareno, Ed and Arlyne McMullin, and Pam Schmidlin who worked on the Suffolk dog parks plus my Nassau colleagues Christine Laubis, Peggy Heijmen, Marie Amsterdam, Joann Garguola and Liz Haban who have taken Suffolk’s success and expanded it into Nassau County. “These dog parks and dog-friendly park policies are great examples of local democracy in action,” said Ginny. LI-DOG continues to work to increase access to public parks and beaches for Long Island dog owners and their dogs. Current campaigns are focused on Nassau County parks, Town of Hempstead parks, and beaches on Long Island. The organization reaches thousands of Long Island dog owners every week through its website, emails, and Facebook and Meetup groups.